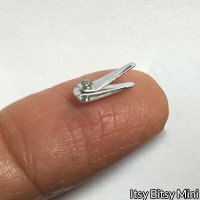 This tiny dollhouse nail clipper is just 5/16 inch long (7 mm). It is highly detailed made from 4 individual metal pieces just like the life-size version. Delicate, for display only. The nail clipper would look adorable paired with our nail polish set (sold separately). One inch scale 1:12.